Alex Gilbert (left) and Dan DuLeone have been best friends since their days at Cherry Hill West High School. Their Red Queen Gaming start-up aims to simplify and encourage development of gaming tools. Once upon a time, video games were pretty basic. Consider Pac-Man, the chomping mouth that devoured small dots while moving through a maze. Now, games are so complex that players need Excel spreadsheets, calculators, and troop-deployment schedules to wage virtual wars, capture castles, and build strategic alliances with players in other states and countries. Having an engineering degree helps. Which is why Lords & Knights — or L&K, as avid gamers call it — intrigued Dan DuLeone, 35, a software engineer from Moorestown, who, even as a child “would spend time trying to hack [any video] game rather than get good at it.” It was a hobby his parents didn’t discourage because he was sharpening code-writing skills, he said. “I said, ‘Lots of people are playing this game and they’re struggling,’” DuLeone recalled of his introduction to L&K. 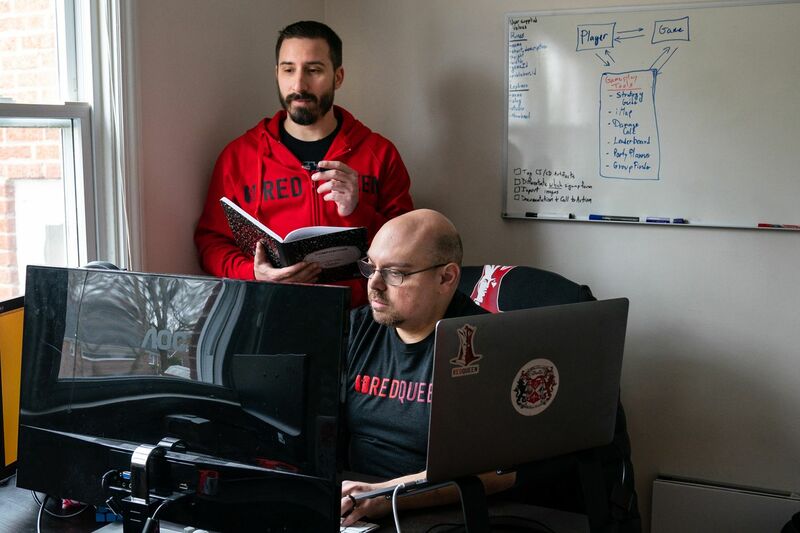 In that agony he found the inspiration for Red Queen Gaming, a Philadelphia start-up created by DuLeone and two others to promote development of gaming tools — aids to improve player experience in what is a multibillion-dollar industry showing no signs of waning. “There is nothing like Red Queen out there and it’s a revolutionary idea for gaming,” said Stuart Graham, 33, of Edinburgh, Scotland, a web and app developer by profession and a gamer since “I can remember.” He started with an Atari ST home computer. A Pokémon map he created to show pokestop and gym locations, a big benefit to rural players of the real-world immersion game, is available on Red Queen’s platform, which recently started charging customers to use. DuLeone, the chief technology officer, and Gilbert have been best friends since their days at Cherry Hill High School West. They launched Red Queen in 2015 as a platform where rune developers can sell their apps to players through a subscription model. The third founder is Bill Smith, who joined the company in 2017 as chief operations officer. Working out of the ic@3401 software incubator at uCity Square in West Philadelphia, Red Queen charges players $3 to $8 a month, depending on how many tools they want to access. Game-playing tools are in great demand. But developing and marketing them is difficult, time-consuming work. And most gamers have full-time jobs, with little interest or insufficient free hours to build websites, scrounge for advertisers, or administer payment systems. In a sense, Red Queen is what Etsy is for artisans. But much more. Last month, it launched an academy to help make tool creation almost as simple as a drag-and-drop experience. Rune developers simply need to plug software codes into a digital portal. Red Queen also has started an incubator to teach aspiring software engineers to code through gaming. The complexity of the video game Lords & Knights inspired Dan DuLeone to start a business to help promote development of tools to make playing difficult games easier. It’s as altruistic as it is market wise. By driving more creators to Red Queen’s platform, more gaming tools will reach more players which, in turn, is a boon for game developers, said Jonathon Beschen, manager of the technology commercialization group at Ben Franklin Technology Partners of Southeastern Pennsylvania, which has invested $50,000 in the company. From an investment perspective, Red Queen’s appeal was readily apparent, said Beschen, 36, a lifelong gamer. It’s doing that by developing good integration with various game developers to let players see data such as telemetry, movement and accuracy, “things that aren’t apparent on the surface but if you tracked them out and saw how people moved, you would do better,” Beschen said. Andrew Linde, 34, of Connecticut, is founder of six-year-old Juncture Media, which is about to release its first game in May for PCs and Macs — AVARIAvs, a competitive game set in a fantasy sci-fi world. Red Queen is helping develop the first gaming tool for it which, Linde said, will enable players of AVARIAvs to have “a larger experience.” Being able to launch the game with such player assistance “increases retention," he said. Having raised $300,000 to fund proof of concept, the company of five employees and 100,000 (mostly free) users, is now embarking on another round of fund-raising, this time looking for $1.5 million through angel investors and partnerships to build upon Red Queen’s platform, incubator and tool-creation academy, Gilbert said. The ultimate goal is to sell to an entity that would find Red Queen’s offerings complementary, such as any big game publisher, something Gilbert said is likely to be accomplished in less than five years. He said Red Queen’s platform has been designed to support other industries, such as pharmaceuticals, automotive and defense, but gaming is the priority for now. Yet, just like any video game player, Red Queen -- named for an evolutionary hypothesis that adaptation is necessary for survival -- has to be able to navigate the challenges to get to a satisfying conclusion.